It can make a person's head spin! I think what it comes down to is education, and more often than not, looking at a company and judging it on an individual basis. It's about setting goals and standards for what you want to feed your family, and then supporting companies that help you meet those standards. When it comes to fish, and I hear the phrases wild versus farmed, I normally gravitate towards wild. You hear stories of how dirty and flavorless and unsanitary fish farms are. But just like anything else, it's not fair to lump all farmed fish into one category. Straight up and honest, I have NOT researched many farmed operations. 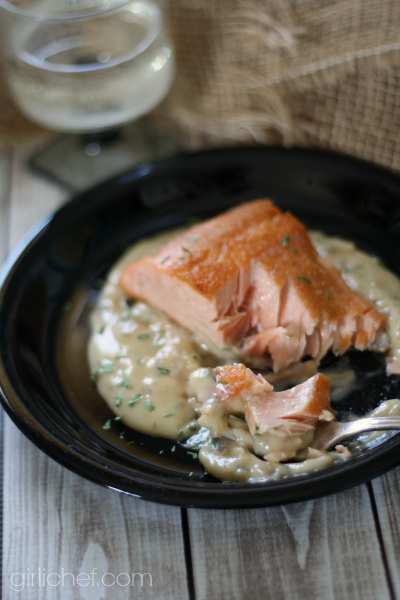 Recently I was offered the chance to try Verlasso salmon (a farmed Atlantic salmon). So, I visited their website. The first thing that "got " me was their philosophy, Raising salmon in harmony with nature. After reading about how they maintain equlibrium and strive for the highest standards, after watching some of their videos, after finding out that Verlasso is the first (and only) ocean-raised farmed Atlantic salmon has a "good alternative" or yellow ranking from Monterey Bay Aquarium’s Seafood Watch® program, I won't be so quick to answer the wild versus farmed phrase when asked next time. That said, not all farmed fish is created equal. Do your research. Reference the Seafood Watch® website. Decide which choice makes you feel best when feeding your family. If this isn't your first time here, you probably know that I like salmon. I like it a LOT. So, I took full advantage of my taste-testing opportunity with Verlasso. I cured some. I grilled some. I roasted some. And with my very last cut, I made a simple lunch of lightly seasoned, seared salmon in a creamy Moscato wine sauce. 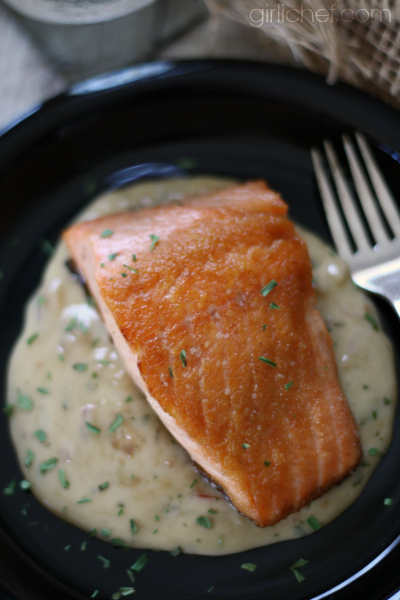 Seared salmon sits atop a pool of bright, tangy, and lightly sweet Moscato creamy sauce. Heat 1 tablespoon of olive oil in a nonstick skillet. Season both sides of salmon with salt and white pepper. Once the oil is very hot, add two pieces of the salmon to the pan, presentation side down. Cook until nicely seared and flip and repeat. Remove to a tray set in a warm oven then repeat with remaining pieces of salmon, adding more oil as needed. Pour out all but a very thin layer of oil from the pan and throw in the onions and garlic. Saute until they begin to turn translucent and softe, 2 minutes or so. Carefully add the Moscato and reduce to 1/4 cup. Add the cream and reduce the whole thing by half. Remove from heat and stir in tarragon, then season to taste with salt and pepper. Serve warm with salmon. So, tell me, do you have strong feelings about which type of fish you eat, wild vs. farmed? Do you check the Seafood Watch before buying a certain variety? What other factors influence the fish and seafood that you feed your family? If you're interested in learning more about Verlasso, maybe finding out what earned them their "yellow ranking", visit the Verlasso website or connect with them on Facebook or Twitter, or check out some of their videos on YouTube or Vimeo. 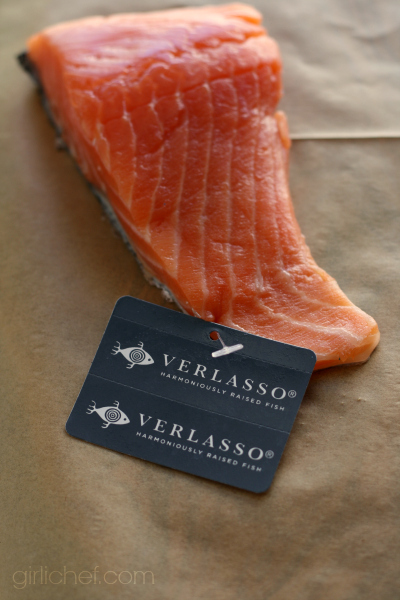 I received a gift card with which to purchase Verlasso salmon for the purposes of testing. All opinions stated in this post are my own.